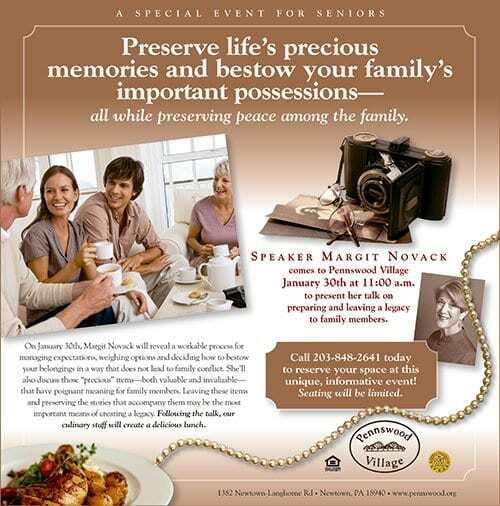 Pennswood Village is a 31-year-old continuing care retirement community in Newtown, Pennsylvania. Throughout much of its history, the distinguished Quaker community in affluent Bucks County enjoyed high occupancy and a strong wait list— all while following the Quaker-influenced philosophy that “if prospects like us, they will call us,” correspondingly limiting resources for marketing staff and lead generation. The community enjoyed prolonged success because of its well-established Life Care contract and especially positive reputation for healthcare services. A recent renovation to its community center, an inspiring art gallery, well-maintained grounds, impressive fitness center, and two pools are all strengths valued by visiting prospects. By February 2012, occupancy had dipped to 88 percent, and the unoccupied residences represented about $5 million in unrealized entrance fees and about $1.1 million in unrealized annualized monthly service fees. As a result, Pennswood leadership recognized that the community needed to change its approach, and chose Love & Company to help it get back on track. Upon visiting the community and performing a sales and marketing assessment, Love & Company made recommendations and immediately began working with Pennswood leadership to implement a plan that would help steer the community back toward full occupancy. On the marketing end, Love & Company developed a marketing plan that helped focus the sales team on hitting benchmarks throughout the year, and developed campaign plans to help it structure events. 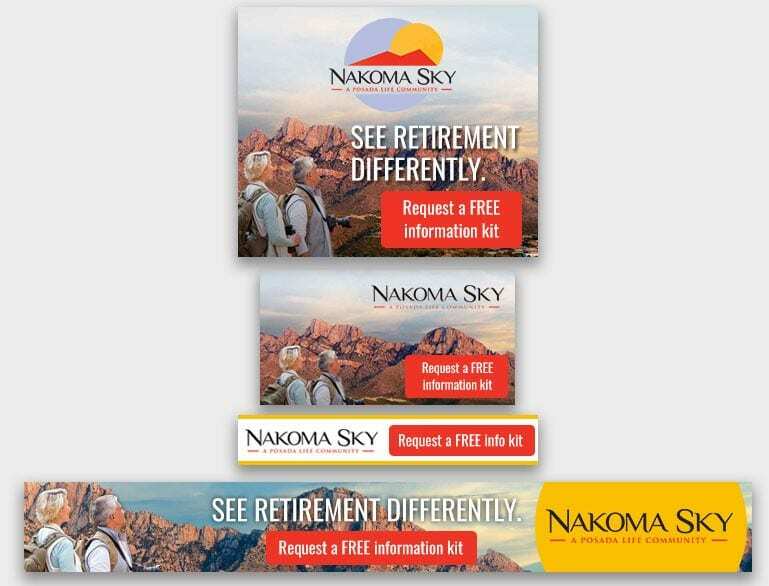 The Love & Company plan also called for the reallocation of significant portions of marketing dollars from print advertising to direct marketing, enhancing resident referrals and increasing Internet-based inquiries without increasing the budget. By refocusing its advertising to include previously unexplored media outlets like the Bucks County Courier Times, community publications like Bucks Local News and a zone of The Philadelphia Inquirer, Pennswood extended its reach, and attracted new age- and income-appropriate prospects who had genuine interest in moving into the community. As one example, the redirected marketing dollars created such a buzz in Bucks County that the community filled multiple events from one mailing. Pennswood even cancelled planned newspaper advertising, as its events completely filled from just that one direct mail invitation. Due to its values as a Quaker community, Pennswood did not feel comfortable with a sales-focused mentality. Love & Company needed to develop a sales system and process that was highly intentional, while maintaining an approach with a soft-sell culture to match the community. To do this, Love & Company offered training and suggestions. To help staff members grasp the new sales systems and processes, Love & Company trained staff on relationship building, discovery and soft-sell closing tactics, and helped them improve how they guided campus tours and how they told the Pennswood story. Love & Company also implemented a strong follow-up program with prospects to ensure consistent and detailed use of the lead management system. This process included upgrading the current lead management system and generating and reviewing detailed sales reports on a weekly, monthly and quarterly basis. To bolster this new approach, Love & Company recommended that the Pennswood team designate specific, marked parking spaces for prospects visiting the community for appointments with marketing staff. To create the right environment for these changes, Love & Company suggested that Pennswood recreate the prospect’s first impression, including creating a new sales office that included a warm “discovery room” for meetings with prospects to help make them feel more comfortable, and a design center that allowed Pennswood to show off its residences’ new standard and signature finishes. Since model apartments were inconsistently furnished with a mixture of donated and new furniture, Love & Company recommended that staff redecorate the model apartments in a way that showcases how rooms will be used—lay out bedrooms as bedrooms and dens as offices or entertainment rooms—and create and maintain an inventory of six “show ready” or move-in condition residences, showcasing the new standard and signature finishes of the community. Love & Company also suggested that the kitchens and flooring style be replaced as residences turn over since the current kitchens were not competitive with area offerings. As part of its rebranding process, Love & Company evaluated Pennswood’s marketing materials, including its website, and made significant recommendations, including developing a clear positioning strategy, revamping the website, freshening language in collateral materials and adding new pictures for print and online advertising that better showcase the vibrant community campus and involved residents. 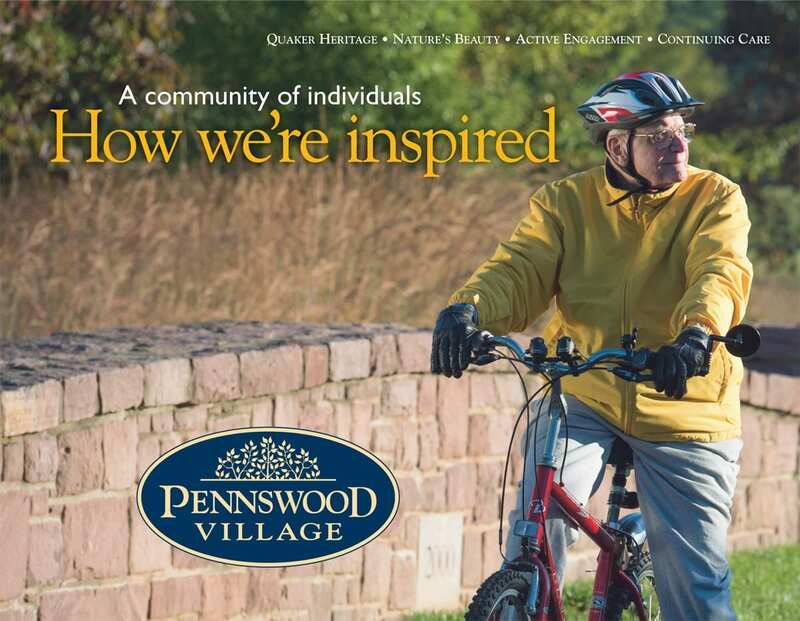 Love & Company conducted a photo shoot at the community, which requested that its residents be featured in advertising, and rebranded Pennswood with a new logo, tagline, stationery package and collateral package, giving it a refreshed feeling. The Quaker community— from residents to leadership—resoundingly approved of the final product, feeling that it truly captured the community’s unique personality. The various recommendations amounted to a significant investment on Pennswood’s part, especially in the first year during which Love & Company implemented the marketing plan, rebranded the community and initiated sales training for staff. Love & Company also suggested that enhancements be made to key areas of the community, such as furniture in the main entrance, the fireplace in the living room, the private dining room and the theater. Pennswood listened and implemented all of the suggestions made by Love & Company. “They spent money to make money, and trusted us for all of the right reasons,” said James Kelly, Love & Company’s vice president of sales and marketing. The sales package copy was changed to reflect Pennswood’s new positioning and give it a competitive edge. 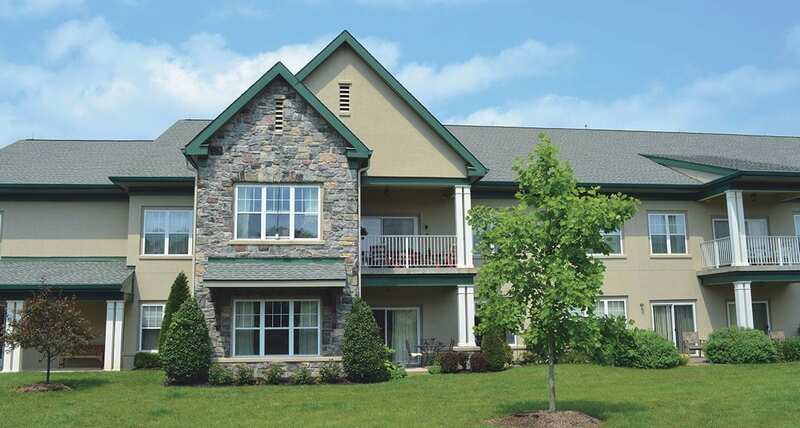 After working with Love & Company for several months to make suggested upgrades and adjustments, receive training and implement new systems, the Pennswood sales and marketing team members have sold 29 residences in just the first six months of this fiscal year, with the potential to fill 12 more, compared with selling 19 residences during all of the previous year. “We thought that we would have a really tough road ahead of us—and, although we are not totally out of the woods—we feel confident that we are doing everything we can to put the best Pennswood forward, and we have Love & Company to thank for pointing and guiding us in that direction,” said Ben Hoyle, Pennswood CEO. Under Hoyle’s leadership, the community continues to strive for excellence: The facilities team is busy making upgrades, dining staff continues to look for ways to improve the food experience, and marketing staff continues to keep its eyes on the future. If you need an integrated approach to help solve a census problem, Love & Company can help. Love & Company provides sales training and support with marketing planning and lead generation, and is consistently successful in helping communities like Pennswood regain census. For results-driven marketing, experienced sales training and creative rebranding, you only need to call one firm: Love & Company. With all the components of the new marketing and sales plan in place, Pennswood closed 29 sales in the first six months of its new fiscal year, compared to only 19 for all of the previous year. 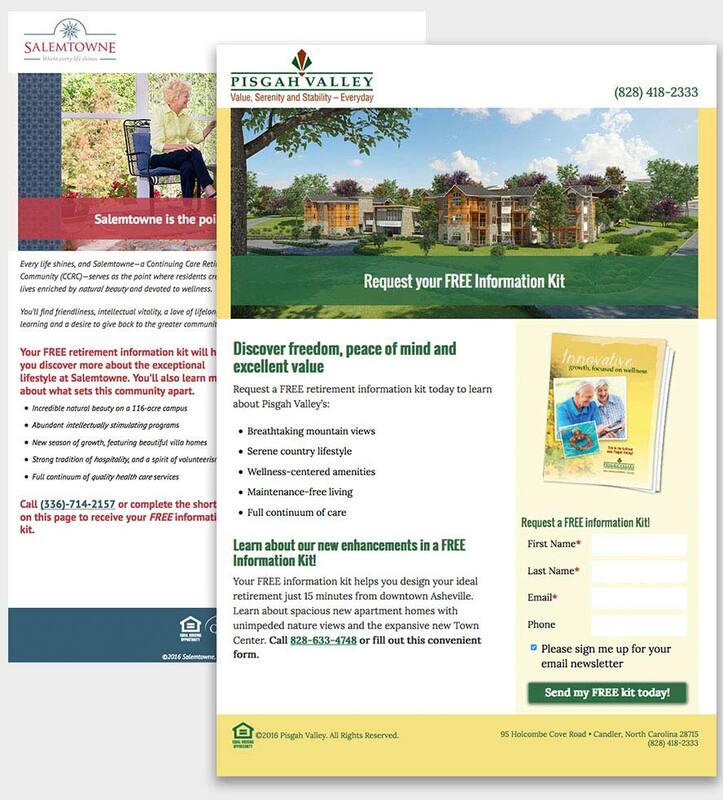 Pennswood Village’s legacy direct mail campaign was so successful that we cancelled advertisements and filled the events with a .6% response rate and $209.25 cost per lead. Pennswood Village’s improved sales package was warmly received by staff and residents.